Quinin (Quinine Sulphate) is administered either as monotherapy or with other medications to treat uncomplicated malaria infections. Its mechanism of action is attacking and eliminating the malarial parasites in the red blood cells. Quinin (Quinine Sulphate) is administered either as monotherapy or with other medications to treat uncomplicated malaria infections. Its mechanism of action is attacking and eliminating the malarial parasites in the red blood cells. This antimalarial medication is widely considered to be effective in areas where chloroquine resistance has been known to occur. Patients should note that this medicine is only used to treat a malaria infection once it has occurred, and it is not safe or effective for preventing malaria. Although this medicine has been studied for nocturnal leg cramps, it may not be effective for this condition, and physicians may advise against using it for this purpose due to the potential health risks. 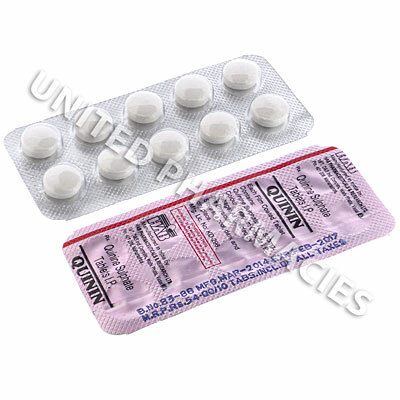 Quinin (Quinine Sulphate) is provided in the form of 300mg tablets for oral administration. Physicians may direct adult patients infected with uncomplicated plasmodium falciparum malaria to administer 600mg every 8 hours, and treatment may last for a period of 7 days. However, slight variations in the dosage regimen may be required based on individual factors such as the patient`s body weight or the severity of symptoms. If the infection is suspected to be resistant to quinine, treatment with other medicines such as doxycycline or clindamycin may be ordered by your physician. Patients will be under the close medical supervision of a physician at all times during treatment so as to ensure that their condition can be properly treated. The list of reactions provided above does not contain all of the possible side effects, and other reactions may also occur. Consult your physician or attend the hospital immediately if you are affected by blurred vision, bloody or discolored urine, fever, poor appetite, tremors or any other severe adverse events not referenced in this paragraph. Quinin (Quinine Sulphate) could cause serious bleeding or kidney problems, due to it triggering a decrease in blood platelets (cells used to form clots). Get medical treatment straight away if you notice bleeding or bruising. Should your fever or symptoms not improve, or if they return after you have ceased treatment, ensure that you consult your physician immediately.